Please send us any comments, product and service questions, or suggestions you have regarding Denney Jewelers so we may serve you better. 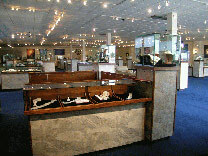 You may also ask about any jewelry products, custom design requests, or special jewelry repair needs that you may have. We will reply to you as soon as possible. You may also give us a call directly at 217.787.0500 Monday-Saturday 10 am - 8 pm CST and Sunday 12 pm - 5 pm CST. Your information will remain entirely within Denney Jewelers, LTD.
We will never sell or release your information to a third party.